Walkers will once again be a headline sponsor of the 2019 GAIM Ops Cayman conference. Walkers Compliance complements Walkers' legal, corporate and fiduciary services to deliver a one-stop-shop for clients looking to use the Cayman Islands jurisdiction for their business needs. Following the result in the United Kingdom's EU referendum, Walkers has created a Brexit page dedicated to providing our clients relevant information about the jurisdictions in which we practise. Walkers is a leading international law firm. We advise on the laws of Bermuda*, the British Virgin Islands, the Cayman Islands, Guernsey, Ireland and Jersey. 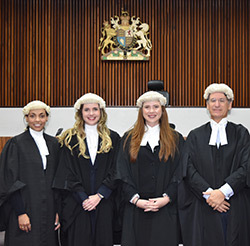 We are pleased to announce that Articled Clerks Gemma Cowan and Sophie Dibb have completed their legal training, both being called to the Cayman Islands Bar. In our latest European Securities Law Update we provide a high-level insight into the Prospectus (Directive 2003/71/EC)(Amendment) Regulations 2018 (S.I. No. 317 of 2018) (the “Amending Regulations”) which were signed into law in August 2018, ushering the second phase of changes under the Prospectus Regulation (Regulation (EU) 2017/1129) (“PD3”) into Irish law (see our previous update here). PD3 itself replaced and repealed EU Directive 2003/71/EC (the “Prospectus Directive”) and forms part of the EU’s Capital Markets Union initiative, which aims to ensure investor protection and market efficiency, while enhancing the internal market for capital. The Amending Regulations update the existing Irish legal framework set out in the Prospectus (Directive 2003/71/EC) Regulations 2005 (S.I. No. 324 of 2005) (the “Irish Prospectus Regulations”) to reflect the directly effective provisions of PD3 that came into force on 21 July 2018, following the first phase provisions that became directly effective on 20 July 2017. The remaining provisions will come into effect on 21 July 2019. An amendment to the existing BVI CRS legislation has been published which introduces new requirements to the existing CRS regime. The amendment is in the form of the Mutual Legal Assistance (Tax Matters) (Amendment) Act, 2018 (“Amendment”), which was published on 4 October 2018. The CRS regime has been in force in the BVI since 1 January 2016. The Amendment requires all British Virgin Islands Financial Institutions to take additional steps to remain compliant with the CRS regime. This Advisory provides a high-level summary of the key new requirements. The one-off registration requirement which previously only applied to Virgin Islands Reporting Financial Institutions has now been expanded to include all Virgin Islands Financial Institutions, regardless of whether Reporting or Non-Reporting. The annual registration deadline is 30 April. Therefore, all Virgin Islands Financial Institutions must register via the BVI Financial Account Reporting System (“BVIFARS”) by 30 April 2019 if they have not already done so. By way of correspondence dated 9 October 2018 to Irish Funds, the trade body representing funds established in Ireland, the Central Bank of Ireland (the “Central Bank”) notified industry of a series of amendments to its procedures for Irish UCITS and Retail Investor Alternative Investment Funds (“RIAIFs”). The welcome procedural amendments, introduced with immediate effect, focus on expediting the processing of certain authorisation and post-authorisation amendments for UCITS and RIAIFs through the introduction of a same-day approval process for those applications. Download the full advisory to see the same day approval process. The Government of the BVI has begun implementing the requirements from the “Transfer Pricing Documentation and Country-by-Country Reporting, Action 13 – 2015 Final Report” (the “Report”), published by the Organisation for Economic Co-operation and Development (“OECD”). The BVI is a member of the OECD’s Inclusive Framework on Base Erosion and Profit Shifting (“BEPS”), which brings together over 100 jurisdictions to collaborate on the implementation of the OECD BEPS Package. All OECD and G20 countries have committed to implementing Country-by-Country Reporting (“CbCR”). On 4 October 2018, the Mutual Legal Assistance (Tax Matters) (Amendment) Act, 2018 (the “2018 Amendment”) was published in the BVI Official Gazette. The 2018 Amendment introduces the new requirements of CbCR to the BVI as required by the Report. The BVI International Tax Authority (“ITA”) is the relevant competent authority. the Irish Auditing and Accounting Supervisory Authority (the “IAASA”) has been given extra supervisory powers in respect of statutory audits. The objective of the 2018 Act is to further transpose the current EU statutory-audit regime into Irish law in order to provide a single legal framework for statutory audits in Ireland.